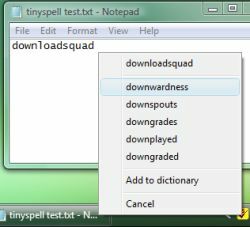 When a misspelled word is detected, click the tinySpell taskbar icon or press the hot-key to pop up a list of suggested replacement words. If the misspelled word is detected during on-the-fly checking or after a word is copied to the clipboard you can select a correction from the list. The selected word is inserted into your document, or is copied to the clipboard (so you can paste it in your document), or both (depending on your settings).